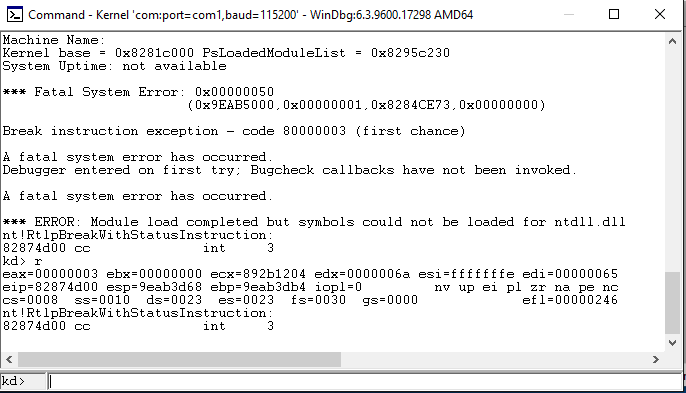 In the previous part we set up kernel debugging and had a brief play with WinDBG. In this part I’m going to work through setting up, communicating with and then hijacking the control flow of the ‘HackSys Extremely Vulnerable Driver’ that was created to go with a series of talks/workshops ran in India. In next part we will take this control and use to give ourselves a root shell. Once you have the source code and necessary tools, open a command prompt in the HackSysExtremeVulnerableDriver\Driver\Source directory and update the ‘Build_HEVD_Vulnerable.bat’ file so that the local symbol server path is set to ‘set localSymbolServerPath=C:\symbols’ (or wherever you set your symbol cache to be in the previous post) before executing the script. A driver is a piece of software which runs in Kernel Mode/Ring 0 designed to directly interact with and provide an interface to a hardware device. You can interact with a driver from User Mode by making use of Input and Output Controls (IOCTLs), A driver defines which IOCTLs it supports by defining them using the CTL_CODE macro which takes the format ‘#define Device_IOCTL_Function_Name CTL_CODE(DeviceType, Function, Method, Access)’, we can see how this is used in our target driver by opening the file ‘HackSysExtremeVulnerableDriver-master\Driver\Source\HackSysExtremeVulnerableDriver.h’ as shown below: As you can see the driver declares 11 different IOCTLs, in this post we will be focusing on the one defined as HACKSYS\_EVD\_IOCTL\_STACK\_OVERFLOW this matches the standard definition format as ‘HACKSYS_EVD’ is the device name and ‘STACK_OVERFLOW’ is the function name. The CTL_CODE macro is being called as follows CTL_CODE(FILE_DEVICE_UNKNOWN, 0x800, METHOD_NEITHER, FILE_READ_DATA | FILE_WRITE_DATA) where the first argument defines what kind of device the driver is for. This is stored in the DeviceType field of the DEVICE_OBJECT structure which is created when a driver is loaded, there is a long list of valid device types but as this device doesn’t fit any of the existing types it is declared with the catch all type ‘FILE_DEVICE_UNKNOWN’. The second/FunctionCode field is basically just an ID that can be referenced, in this case 0x800. Values under 0x800 are used by Microsoft and 0x800 or greater can be used by vendors, each function the driver supports has a different FunctionCode. The third argument (Method, sometimes referred to as TransferType) defines how a user process interacting with the driver will send and receive data from it, this field should be one of five different values. The first value is METHOD_BUFFERED in which input buffers are copied from user mode memory to kernel mode memory by the IO Manager (which is part of the kernel) before being used and output buffers do the reverse. The second and third potential values are METHOD_IN_DIRECT and METHOD_OUT_DIRECT (normally referred to together under the name ‘Direct I/O’) in this mode input, output or both (by ORing the constants, which is the fourth potential value) types of buffer are used when the driver needs to transfer large amounts of data, this normally involves using DMA (Direct Memory Access) or similar methods. The final possible value is the one that the HackSys driver is using: METHOD_NEITHER, as the name suggests this uses none of the previous methods and instead the driver has direct access to any input and output buffers in User Mode memory. The first argument hDevice is a HANDLE to the device driver we want to send requests to, this can be acquired using the CreateFile function as you can see in the code sample coming up. The second argument dwIoControlCode is one of the IOCTLs we saw defined earlier - in this case we are interested in ‘HACKSYS_EVD_IOCTL_STACK_OVERFLOW’. The lpInBuffer and lpOutBuffer arguments (both or either of which can be NULL) are pointers to the I/O buffers and nInBufferSize and nOutBufferSize are their sizes. The lpBytesReturned argument is a pointer to a dword which will contain the number of bytes written into the output buffer after a request has been completed. Finally the lpOverlapped variable is optional and is a pointer to an OVERLAPPED structure which defines various details about using asynchronous IO, we won’t be using this so we’ll only see it set as NULL. GENERIC_READ | GENERIC_WRITE,					//dwDesiredAccess - type of access to the file, can be read, write, both or neither. We want read and write because thats the permission the driver declares we need. FILE_SHARE_READ | FILE_SHARE_WRITE,				//dwShareMode - other processes can read and write to the driver while we're using it but not delete it - FILE_SHARE_DELETE would enable this. NULL,											//lpSecurityAttributes - Optional, security descriptor for the returned handle and declares whether inheriting processes can access it - unneeded for us. OPEN_EXISTING,									//dwCreationDisposition - what to do if the file/device doesn't exist, in this case only opens it if it already exists, returning an error if it doesn't. FILE_ATTRIBUTE_NORMAL | FILE_FLAG_OVERLAPPED,	//dwFlagsAndAttributes - In this case the FILE_ATTRIBUTE_NORMAL means that the device has no special file attributes and FILE_FLAG_OVERLAPPED means that the device is being opened for async IO. NULL);											//hTemplateFile - Optional, only used when creating a new file - takes a handle to a template file which defineds various attributes for the file being created. When we look in the debugger on the debugging machine we can see that we have caused a fatal exception, triggering a Bugcheck (also known as the infamous Blue Screen of Death) Now that we understand what the driver does, how to communicate with it and how to crash it, we can start to put an exploit together.